Draw Weight: 5 to 45 lbs. The Cruzer Lite is one of the best in the Bear Archery Lineup. This compound bow caught many archers by surprise during its release. Not only is it a very fast bow, it doesn’t have a lot of hand shock for a 6-inch brace height. One of the most impressive features of the Bear Archery Lineup is tunability. They have expertly integrated this feature into the Cruzer Lite. Its notable tunability allows your kid to work on the bow in the field. 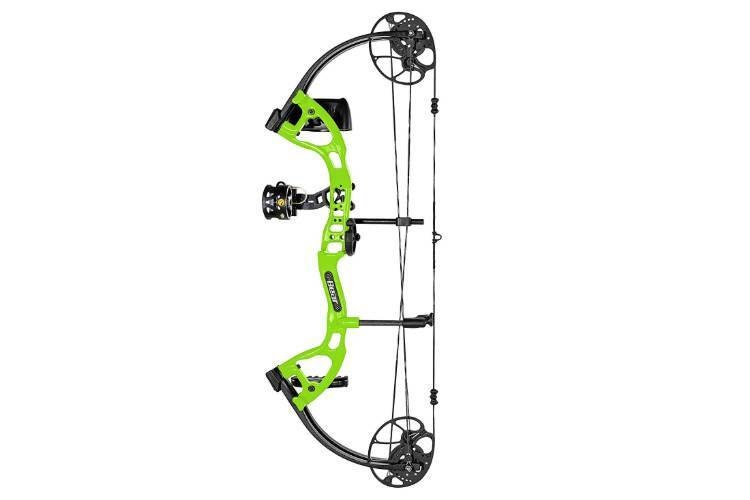 This is a great starter compound bow. Your kid can draw and shoot the bow without strain at 45 pounds to develop good form, and then you can crank up the poundage with another model. Basically, it is adjustable from childhood to legend. The riser is made of machined aluminum. Tuned on a duplicating lathe with features and weight reducing cutouts, precisely tuned. The Cruzer Lite riser is one of the strongest and most precise of all types of handle construction. The 27 1/8-inch axle to axle length is a compact, suitable measurement for young archers. The riser design is quite simple. It is integrated with a string stop system, which helps to keep the string off the arms of a young, new archer. The Cruzer Lite features an older design of the cable slide system, which is a perfect match for the 45-pound maximum draw weight. You may find it a little difficult to describe the draw cycle because it differs at the draw length of 12 inches and at the draw length of 27 inches. The string seems to present some slack at lower draw weights and shorter draw lengths. In fact, it may take a moment before the weight is felt. The draw cycle also tends to be more definite when there is an increase in draw weight and draw length. Unlike most conventional compound bows on the market, the Cruzer Lite features dual cams, which are specifically engineered to offer easy adjustability. The cams are not very aggressive, which guarantees a smooth draw. However, this tends to lessen top end speed. Regardless, the Cruzer Lite is still capable of hitting 290 FPS. The dual cam system of the Cruzer Lite seems to have a sloppy back wall. This may not be a problem for young or beginner archers, but may result in poor accuracy for very experienced shooters. Perhaps what is so appealing about the Cruzer Lite is its tunability, easiness and suitability for young bow hunters. It is an ideal fit for kids who are as young as 7 years old. This bow truly is ready to hunt. The draw weight adjusts suitably from 5 to 45 pounds and the draw length adjusts from 12 to 27 inches. Its hunting features make it a really nice bow for your kid or your wife because it doesn’t require a lot of muscle to deliver a kill shot. It is very much capable of taking down a deer. The 6-inch brace height is more important to shooting accurately. Irrespective of a few errors, your kid will still be able to cast the arrow close to where he or she is aiming. The 70% let-off in poundage allows your young archer to maximize his or her poundage. This makes judging distance slightly less critical and hunting more effective. The Cruzer Lite doesn’t come with arrows. So, you have to buy some for your own use. Typically, good and steady results can only be obtained if you have the ideal arrows with you. The most suitable arrows for your kid must fit his or her draw length and poundage of the bow. The arrows have to be selected with respect to their usage (hunting, shooting, or target practice). According to the IBO, the arrow weight should be a minimum of 5 grains for every pound of the draw weight. It is advisable to consider the recommendation of IBO because firing a lighter arrow may result into dry firing. This may most likely cause damage to your younger or beginner archer or the compound bow itself. It comes with a ready to hunt package, which is a nice bonus. The RTH package is factory installed, including five Trophy Ridge accessories. The Cruzer Lite is a very nice shooting bow for younger archers because it is very adjustable. Not to mention that it is a good choice for beginners or women with small bodies. Instead of buying a new compound bow, every time your child grows a year older, Bear has a solution for you, which is the Cruzer Lite. The lightweight materials of the bow and the short axle to axle length make controlling the Cruzer Lite a breeze for a kid.